Discover luxury expedition cruising on the Peruvian Amazon. The 43-passenger Delfin III offers passengers an illuminating journey that simultaneously bathes you in luxury and immerses you in nature as you discover the delights of the Peruvian Amazon. A great effort has been made to ensure that, despite the abundant 5* comforts and conveniences on board, the rainforest is never far away. The vessel has been tastefully and beautifully appointed in sustainable hard woods, colorful, handmade Peruvian textiles and ancient tools and artwork from local villages. 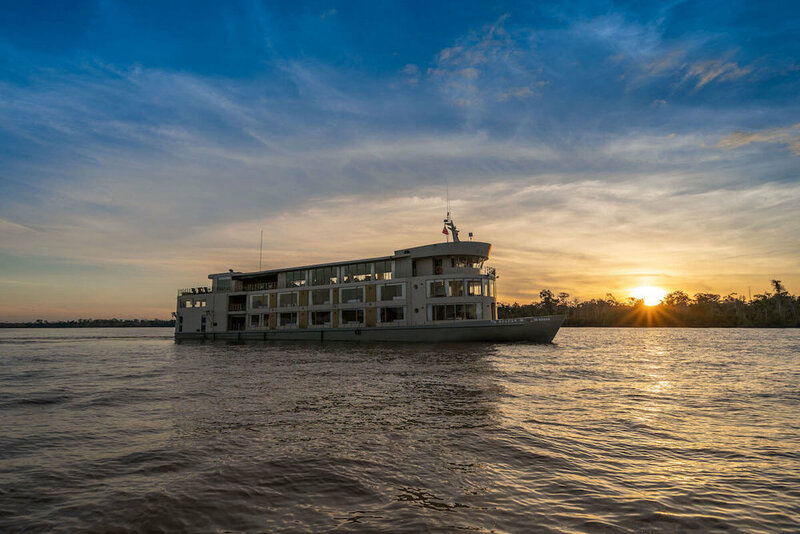 At 170 feet, this intimate yet spacious river-ship is uniquely capable of providing an unforgettable Amazon River experience. The open-air Observation Deck is the hub of activity on the Delfin III. Here you can practice yoga or savor a rich Peruvian coffee as you watch the sunrise. Curl up with a book on a cushioned chaise or go for a dip in the sparkling plunge pool. And in the evening, gather in the shaded lounge to sip Pisco Sours, or some national brand beers as you revel in the sounds of the jungle coming to life. 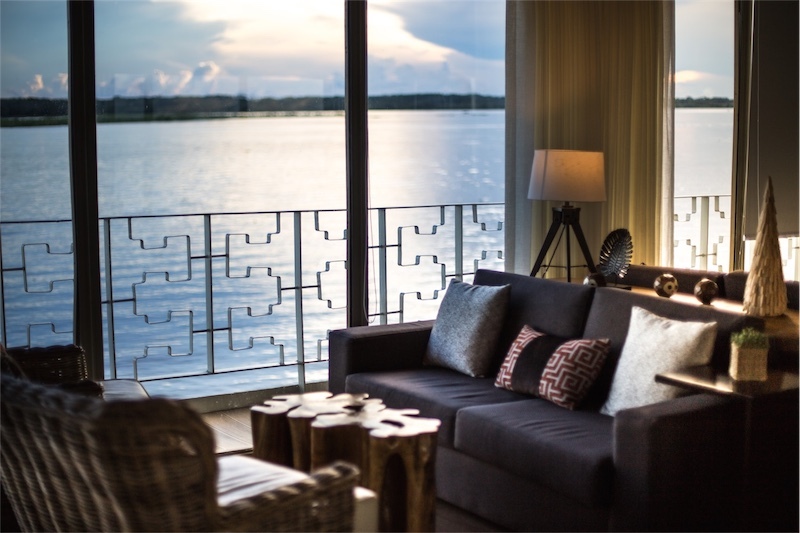 In the heat of the Amazonian afternoons, the neighboring elegant, air-conditioned Canopy Lounge keeps you connected to the rainforest with floor-to-ceiling, panoramic windows and locally inspired decor. Here, cultural performances, lively discussions with expert naturalists, Peruvian cooking classes, and nightly entertainment around the bar enrich and delight as the ship’s staff cater to your every whim. In the Andes Dining Room, the ship’s expert culinary team will present you with dazzling international gourmet cuisine creations, with local dishes infused with flavors and inspiration from the rainforest around you. As you take in the passing scenery, you’ll delight in menus featuring roasted meats, lightly grilled fish, fresh vegetables, sun-ripened tropical fruits, and decadent desserts as you make the most of the free-flow house wine with your dinner. Since ancient times, the Amazon rainforest has been the ultimate source of mystique-filled cures and exotic elixirs. In the serene Rainforest Spa, this tradition continues with indulgent remedies. Yucamani stone massages, soothing avocado wraps, invigorating coffee-cacao scrubs that promote wellness and rejuvenation for the mind and body. For those that prefer to relax with a good work out, never fear, there is also on on board gym. When not enjoying the comforts of the social areas, if you are on board, chances are you'll be relaxing in your equally comfortable suite or stateroom. Both spacious and well-appointed, her on board accommodations all offer individual climate control, daily housekeeping with turndown service, purified water replenished daily, your own iron & ironing board, in-room electronic safe, all natural therapeutic bath amenities, copious amounts of storage space and much more. A special mention must go to the additional services provided to those guests lucky enough to be staying in the one of the Corner or Owner's Suites, including a complimentary 30-minute spa treatment, mini-bar with water and soft drinks, shoe-cleaning upon request, 10 pieces of laundry, and for those in the Owner's Suite, also a scented bath on request. Adorning the social areas and cabins throughout the vessel hangs artwork by Peru’s leading contemporary artists as well as authentic and locally driven craftwork - from the wood carved furniture to the hand woven palm leaf ceilings. If any artwork strikes your fancy, you may purchase it and have it shipped to the comforts of your home for the perfect souvenir. 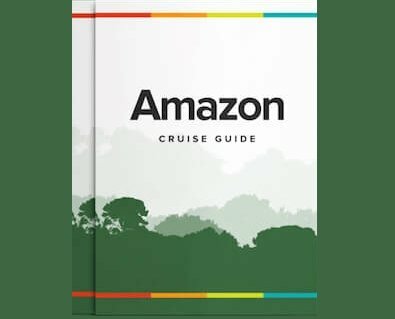 Off the boat passengers will explore the Amazon by foot and skiff on a comprehensive shore excursion program with local expert naturalist guides, in groups no larger than 15 passengers, a great guide-to-passenger ratio for a fascinating and rewarding experience. For more information on what an Delfin III cruise is like, why not check out our expert review.